HAZET torque wrenches are designed solely for tightening screw connections. The wrench is not intended to be used as a lever tool, clamping tool or impact tool under any circumstances! Torque wrenches are calibrated hand tools and must be handled accordingly with due care. Avoid any mechanical, chemical and thermal exposure that goes beyond the the stresses of normal use. The torque wrench must never be immersed in liquids or used as an impact tool as this can pose a risk of accidents and damage. Extreme climatic conditions (cold, heat, air humidity) can have an effect on release accuracy. Before using the device, check that the insert and/or the insert tool holder used are seated firmly. Position the tool so that it cannot slip from the screw joint. This poses a hazard to persons and/or a risk of material damage. When using inserts or insert tool holders, ensure their design conforms to standards and that their shape and size are correct for the screw joint to be tightened. Also adhere to the maximum permitted load for the insert or insert tool holder used. This can be lower than the achievable release torque for the torque wrench. Custom-made tools can be dangerous and may not be used. Failure to comply can result in injury and/or material damage. DIN EN ISO 6789:2003 demands ± 4% or ± 6% release accuracy tolerance in the direction of actuation. HAZET achieves ± 4% with System 5000, ± 2% with System 6000 and ± 3% with System 6000 US standard as well as HAZET no. 6150-1 CT and 6160-1 CT. The direction of actuation with which this release accuracy tolerance is achieved is identified by an arrow mark on the main pipe. All torque wrenches have both a setting scale and an automatic close-gap release – audible and palpable when torque setting is reached. At low values the perceptible signal gets weaker. This is also visually perceptible in products with a signal button. Each HAZET torque wrench is equipped with a manufacturer&apos;s test certificate according to DIN 55350 - 18 - 4.2.2. You can find the set torque value and the insert tool used there in the manufacturer&apos;s test certificate. You can find the effective length of the used insert tool in the current tool manual. When using insert tools that cannot be adapted with a torque setting device, we recommend setting the torque using an insert ratchet or insert square with the same effective length. When using insert tools with a different effective length, the torque to be set must be calculated (you can find the corresponding formula in our tool catalogue). In addition to our extensive range of torque wrenches, we also offer the necessary service. 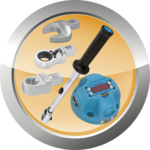 Here we offer adjustment, calibration and repair for all torque wrenches / test devices. Maintenance service boxes are also available for our mechanical torque wrenches. You can find associated documents, such as operating instructions, on our torque technology in the online catalogue or in our spare parts shop.